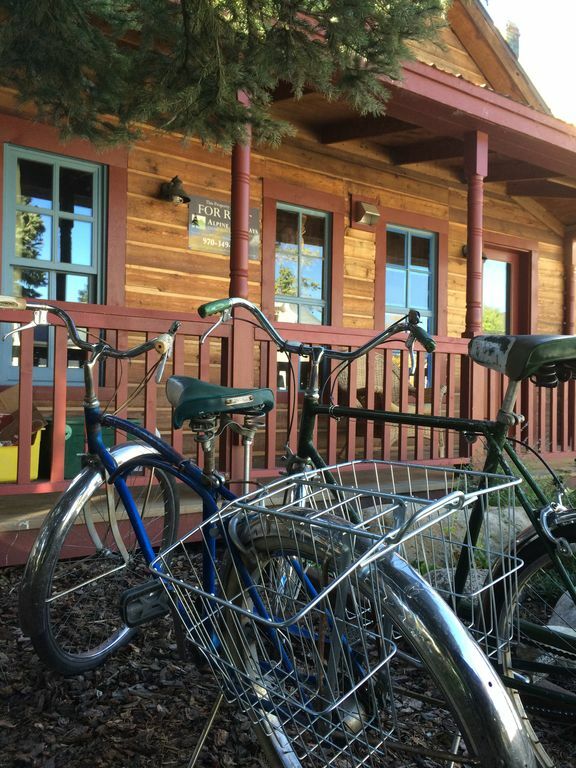 Located just 2 blocks off Elk Avenue in historic downtown Crested Butte, Karla's Cottage is an adorable two bedroom, two bath cottage ready for your next getaway! Fully remodeled with lots of charm and a location that can't be beat, this property offers in-town convenience for an out of town price! Step inside Karla's Cottage and you will immediately feel at home. The property has recently undergone a complete renovation, head to toe, and the layout is ideal for all of your vacation needs. The kitchen, complete with ceramic tiled counter tops and stainless steel appliances, opens to the living room with vaulted ceilings, large windows, and a wood burning stove. It's the perfect place to entertain your friends or family after a long day of skiing, biking, or touring the town. On those warm summer days, step right outside to the gorgeous landscaped yard and relax with a book or fire up the grill. It's the ideal place to simply 'be' in Crested Butte! The main level bedroom has a comfortable queen bed and a full, 'jack and jill' style bathroom that connects to the bedroom and the hallway off of the living room for easy access. Upstairs the master suite is equipped with a queen bed, en-suite bathroom, and a nice seating area complete with a couch and end table! In addition, the couch in the living room folds out to a bed...perfect for kids or extra friends! Location was great, house was adorable, beds we pretty comfy with loads of blankets and perfect size for family of three with one large dog. House was well stocked with everything you need. The large mud room was great for all our gear-could use some boot trays and ski hooks but we did fine without. The on demand hot water heater gave us loads of hot water to fill the jetted tub and take warm showers. The one minor negative was the lining under the rug on the loft floor made a wierd crackling noise that was pretty loud for those on the 1st floor but we were all exhausted after our ski days that we went to bed at the same time anyway so it wasn’t a huge deal. We would definitely stay here again without hesitation! Thanks for the great review Jennifer! I am happy to know that you enjoyed the home and everything it has to offer. I'll pass the information on to the owner in regards to the boot tray and ski hooks. As far as the liner under the rug goes, I will take a look at that, but it may just be the floors. Thanks again and we hope to have you back again sometime soon! We had a wonderful stay at Karla's cottage. It was beautiful inside and very cozy despite the feet of snow outside. The location was perfect. It was a convenient, short walk to all the restaurants and the supermarket. The shuttle to the mountain was right outside and the XC center was on the next block. Hope to get out to Crested Butte in the summer and would definitely stay here again. Thanks for the nice review Elizah. I am happy to know how much you enjoyed Karla's Cottage and appreciated its convenient location. We hope to have you back soon! We enjoyed our stay at Karla's Cottage. It was an easy walk to any of the restaurants and businesses on our wish list. The wood stove and provided firewood were nice to have. The house was well-stocked, nicely decorated, and had good documentation on how-to items and local recommendations. The enclosed backyard was ideal for dogs. Some areas that could be improved: the technology in the living room could use some updating (non-HD channels; TV seemed small for room size; some key channels like ESPN missing and no access to streaming apps; no Bluetooth soundbar/portable speaker for playing music; some newer phones don't have an aux jack and can't hook up to the stereo). Guests might want to bring a Fire Stick/Roku/Chromecast and a Bluetooth speaker. Light sleepers downstairs might be affected by the noise when upstairs guests walk around (crunching/creaking sounds). Open space upstairs bathroom (not fully enclosed) might cause issues for some groups. I am happy to know that you enjoyed Karla's Cottage as well as, the location and the fenced in yard. I will pass the feedback on to the owners in regards to the technology etc. Thanks and we hope to have you back soon! Update: Owners will be updating the technology and channels this spring . Thanks again! Beautiful property! Great location in heart of downtown Crested Butte. skating rink, restaurants and shopping! Would totally stay again & would recommend to family & friends! We are so happy that you enjoyed yourselves at Karla's Cottage as well as, Crested Butte! It is a lovely home and look forward to having you back one day - hopefully sooner that later! Comfy small home with all the perks located 2 blocks from the main drag. Nice fenced yard for the dogs. Would surely stay here again. Overall, a great spot in a great location. This cottage is well appointed and sits at a great location; close to restaurants, shopping, and the bus to the mountain. Was a great fit for our family of four. Well equipped kitchen, two queen/full beds, and a fold out couch. Overall this is a great update to a cool, historic house. The main disappointment was not being able to gett enough hot water to the jacuzzi tub upstairs for anything more than a warm-ish bath (shower downstairs gets very hot though). Also note that the upstairs toilet is fully exposed (no door to close). So, the house has a few oddities, but overall a nice place to stay.